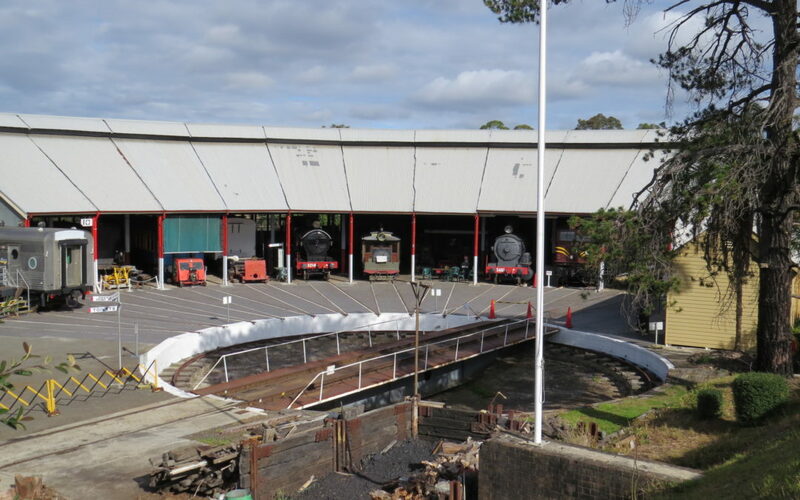 As part of History Week, and in conjunction with the History Council of NSW, the Valley Heights Rail Museum is pleased to announce a new exhibition under the theme “Life & Death”. Titled “The Final Journey: Making tracks to the last station”, the event is being held over the weekend of 8-9 September 2018. A number of intriguing 30 minute presentations will be made over the two days and are included in the Museum’s regular admission fees, which also allow for twenty minute rides on our 120 year old steam train, the “Valley Heights Mixed”. Guest speakers from Rookwood Cemetery, Glenbrook Historical Society, the Tramway Society and the Museum, will explore various aspects of the theme in a surprising and respectful way. Some unusual railway history will be revealed with little known facts and personal stories taking you on the full journey, from “Life” to “Death”. Then browse the shop and enjoy a tea, espresso coffee or cold drink and a “railway” pie at the café. In a great coup for the Museum at Valley Heights in the Blue Mountains, in a joint venture with MAAS (Powerhouse Museum), Transport Heritage NSW and the Valley Heights Steam Tramway, a tram assembly will take place, as seen on the streets of Sydney and Newcastle 80 years ago. It has just been announced that over the weekend of September 8/9, a unique Tram Hearse, rarely seen by the general public, will be reunited with a Tram Car and Steam Tram motor as regularly used in the early 1900s. These three exhibits, with an average age of 130 years, form an important part of a new exhibition “The Final Journey: Making tracks to the last station” that is being held during History Week. This year’s theme of “Life & Death”, will be interpreted in several ways, but will include presentations on a wide range of topics, including the Mortuary Station & Rookwood Cemetery, Births on the tracks, Safety around railways, a Disaster averted in 1906, and the love/hate relationship that the press and public had with trams in the late 19th century. Another unique exhibit (on loan from the NSW Rail Museum at Thirlmere) is a Coffin Cart that was used to move the departed across the platform to the waiting train. Admission to the exhibition will included in the Museum’s normal fees, that also include steam train rides and access to all the usual exhibits, large and small. Two model rooms will fascinate the children, and to complete the picture, the café is open for a basic lunch and hot or cold drink. Andrew Tester is a founder member of the Museum in 1994 and current Safety Committee Chairman speaks about rail safety and behaving sensibly near trains, tracks, stations and other railway infrastructure. Bruce Irwin is a long time member of the Steam Tram and Railway Preservation Society (STARPS) covers the history of the unique Tram Hearse that was used to transport coffins and mourners along the streets of Sydney over 100 years ago. This presentation, “Mangling Done Here” also covers the macabre topic of tram accidents and the adverse press reaction in the late 19th century. Doug Knowles is the past President of Glenbrook Historical Society, local History Walks Team Leader and Glenbrook Museum Supervisor. Doug reveals the fascinating story of the Skarratt watch, awarded for the outstanding efforts of two young men in averting death and destruction on the rails in 1906. Keith Ward is the Publicity Manager at Valley Heights. Keith tells the unusual tales of those born on or around railways, with some surprise inclusions. So for them “Life begins - on the right track!” and their first cries were met with train whistles or toots! Mark Bundy is General Operations Manager at Rookwood Cemetery. He explains the remarkable history of the Mortuary Station at Sydney Central, the rail connection to Rookwood and the use of the Coffin Cart in transferring the deceased to and from hearse to railway wagon. Page Updated: Wednesday, 07-Nov-2018 14:07:28 PST.